Did you see that piece on Campaign last week? "How advertising failed Hillary Clinton ..."
But didn't you think—as I did—that it was actually the other way round? Advertising didn't fail Hillary Clinton; Hillary Clinton failed advertising. If a product is so unappealing, there is only so much our industry can do. And not since the Austin Allegro has there been a product as unappealing as Hillary Clinton. How bad have you got to be to lose to an obnoxious, orange-faced monster such as Donald Trump? A bigoted boor who didn't even bother to hide his contempt for large swathes of the electorate. 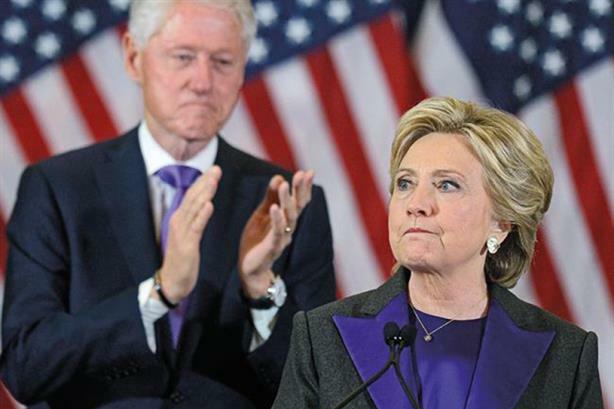 Despite vastly superior riches, resources, and the entire U.S. establishment on her side, Clinton still managed to lose. Any other candidate would have thrashed him. So the blame must lie with the Democratic Party—the pigheaded, clueless clients—for choosing her. What were they thinking? While millions of Americans were taking Trump seriously but not literally, these fools were taking him literally but not seriously. Since her "shock" defeat, heads have been shaken and hands have been wrung. Her loss has been framed as a failure of advertising. More specifically, a failure of traditional advertising. Trump's adspend was a fraction of Clinton's; he tended to spread his message via social media. "Well, there you are," the digital evangelists say. "If only Hillary had done the same, the result would have been very different." And indeed it would. Her defeat would have been even heavier. OK, if we can't blame advertising, let's try misogyny. Yes, people wouldn't vote for her because she was a woman. No, people wouldn't vote for her because she was hopeless. Literally. She offered no hope, no change and no hope of change. Americans would have happily voted for a female president. Just not this one. I have no doubt that if the Democrats had chosen Elizabeth Warren, she would now be on her way to the White House. Clinton was yesterday's product—the fax machine, the VHS. And she was further flawed by her association with her husband Bill and all that he embodied. And like Blair and Blur, the "First Dude" isn't quite as popular as he was in the 1990s. When voters decide that even the House of Trump is better than the House of Cards, all the media money in the world won't change their minds. There is nothing advertising could have done. Unfortunately, the world was counting on Clinton to save it from a Trump presidency. But in failing to do so, she didn't just fail advertising, she failed us all. Though reading what I've just written, I feel I should issue an unreserved apology. Paul Burke is an award-winning copywriter and novelist who has worked at Abbott Mead Vickers BBDO, BMP DDB, J. Walter Thompson, and Y&R.